CITIZEN- the Company was established in 1924. The founding fathers selected the name Citizen so it would be “Close to the Hearts of People Everywhere” and soon after adopted the company’s formal name, Citizen Watch Company. But a range which made them closer to people’s hearts is Eco-drive with atomic timekeeping, as can be seen in this Citizen AT8010-58E World Chronograph A-T.
Japanese quartz movement is a type of self-winding watch movement developed in Japan which uses a quartz crystal to keep time. These watches do not have the environmental impact that battery-operated watches do. Japanese quartz movement on a watch also means that the inside of the watch, the part that makes the hands move and keep time, were made in the country of Japan. This fine-looking Citizen mens watch is crafted in stainless steel case with a patterned black dial and non-reflective sapphire crystal. The patterned dial base creates an illusion and can leave you spell bounded. 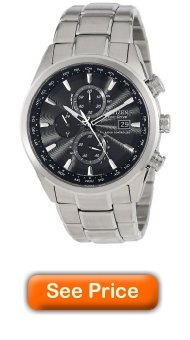 The Citizen Eco-Drive World Chronograph A-T is a radio-controlled perpetual calendar chronograph world timer with atomic timekeeping in 5 time zones (North America, the UK, Europe, Japan and China) and automatic time in 26 world cities. Specific functions also include a 1/20 second chronograph that measures up to 60 minutes, perpetual calendar, 12/24 hour time, day-date, alarm and power reserve indicator. Detailing in three sub-dials is given completely different and also kept minimalistic. Additional details include a 43mm case and 200 meter water resistance. Citizen Eco-Drive is fueled by light, any light, so it never needs a battery. Combined with atomic timekeeping, it is the most accurate watch in the world. Citizen has staked out a new position as the leader in timekeeping with its Eco-Drives watches that are light powered. With models ranging from dress models to sports models to professional dive watches, Citizen Eco-Drive runs continuously in any kind of natural or artificial light for a lifetime of use. Fueled by light, it never needs a battery. So light your wardrobe up and get set to shine!